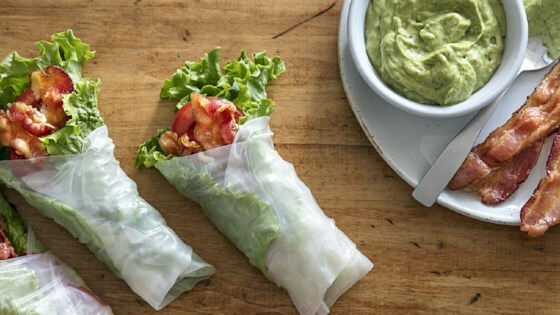 "These spring rolls are filled with lettuce, hickory smoked bacon, and tomato slices, and they're served with an avocado/coconut milk dipping sauce." In a 12-inch skillet cook bacon on medium-high heat until browned and crisp. Remove to paper towels to drain. Fill a large bowl with warm water. Dip one rice paper into water for a few seconds or just until moistened. Rice paper will still be firm but continue to soften during assembly. Place on work surface. Top rice paper with lettuce leaf. Arrange 2 bacon slices across the lower third of the rice paper. Arrange tomato slices over bacon. Fold bottom of rice paper over filling. Fold in sides leaving the top of the roll open; roll up tightly. Repeat with the remaining rice papers, lettuce, bacon, and tomato slices. For dipping sauce, place avocados, cilantro, green onions, and lime juice in a food processor. Cover and process until smooth, about 1 minute. Add coconut milk. Process 1 to 2 minutes more or until smooth. Season to taste with salt and pepper. Serve spring rolls with dipping sauce. Check out this technique for fresh spring rolls using any filling ingredients!